Avik’s at Forbes, Austin’s staying right here. On February 1, 2011, Avik Roy moved his health care policy blog to Forbes (http://www.forbes.com/sites/theapothecary/). Avik’s writings prior to that date will remain archived at this site. In the meantime, for you Bramwellians out there, avikroy.net will continue to host a compilation of Austin Bramwell’s work, both past and current. For an introduction to Austin’s writings on culture and society, please read this post. If any of the links appear broken, try substituting "avikroy.net" for "avikroy.org" in the URL window. I’m pleased to announce that The Apothecary is moving to Forbes.com (http://www.forbes.com/sites/theapothecary/). 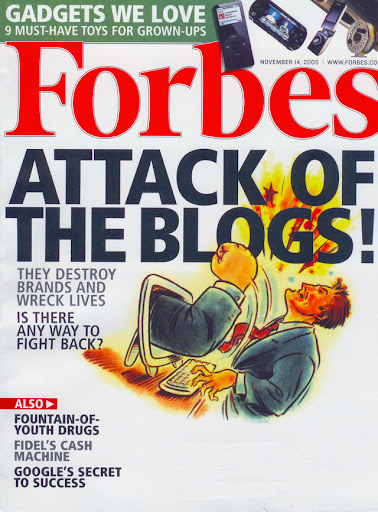 Forbes.com is one of the more widely-read websites in the world, with more than 23 million unique visitors a month. One of the things I’ve found most rewarding about The Apothecary is that it has attracted a politically diverse audience, and I’m optimistic that joining Forbes will help further that trend. Avikroy.org will continue to host my prior work, along with that of Austin Bramwell, and I’m sure I’ll be referring to old blog posts from here for quite some time. Forbes has invested considerable resources into online media, exemplified by their recent acquisition of Lewis DVorkin’s True/Slant. Lewis now heads up new media development for Forbes, where he is implementing his vision of “entrepreneurial journalism.” To me, this concept makes perfect sense. I’m grateful to Bob Langreth and Matt Herper at Forbes for giving me the opportunity to participate. I’m also grateful to Rich Lowry and Reihan Salam at National Review, for whom I will continue to write, and also Yuval Levin at National Affairs, who gave me my start as a writer on health policy. I’ve learned much from all three, and I would be nowhere without their sponsorship of my work. On health care, I have no idea what our basic guiding principle is. Seriously, I don’t…There are certainly many very good conservative health care scholars whose work I should have been reading more closely these last few years. But politics is a battle of perceptions, and the perception—that became reality—was that Republicans brought a knife to a gun fight when it came a debate about the scope and reach of health care reform. This conservative skeptical indifference to health care policy has deep historical roots. The modern American conservative movement was founded in the 1950s by men such as William F. Buckley, Jr., Friedrich Hayek, and Russell Kirk, for whom the New Deal, World War II, and the Soviet Union were formative. The grand ambition of American conservatives in the second half of the twentieth century was defeating communism abroad, and expanding free markets at home. In those days, the government played a relatively small role in health care policy, and so these men had bigger fish to fry. For the generation of conservatives who were reared by the Buckleys and the Kirks, 1964 was a seminal year. It was the year of Barry Goldwater’s campaign for the Presidency: the first true free-market conservative to gain the Republican nomination since Calvin Coolidge. Goldwater’s uncompromising defense of individual liberty inspired millions of Americans. Ronald Reagan’s speech at the 1964 Republican National Convention—a speech that anyone who thinks of Reagan as an “amiable dunce” must watch—launched the Californian to national prominence. When Reagan was elected President in 1980, and in 1989 when the Berlin Wall fell, it appeared that conservatives had gained the epochal victories that they had worked for half a century to achieve. To those conservatives who had worked in the Reagan White House and had built the institutions that supplied that White House with intellectual energy, 1964 was a year of triumph, a year in which true-blue conservatives took control of a major political party. There was only one problem. Goldwater got annihilated in the election of 1964. Lyndon Johnson was swept into office with one of the largest ideological majorities since the Civil War. Johnson embarked on a “war on poverty,” and signed the Medicare and Medicaid programs into law. Though conservatives fought against these programs, many saw conservatives’ opposition, as Lionel Trilling had put it, as an “irritable mental gesture.” After all, the government projected that Medicare would cost approximately $12 billion by 1990, inclusive of inflation. Wasn’t it worth it to guarantee health care for the elderly for that price? But, when 1990 finally came around, we weren’t spending $12 billion on Medicare, but $107 billion. In 2010, we spent $520 billion on Medicare, and a similar amount on Medicaid. Today, according to long-term projections of the Congressional Budget Office, every dollar of growth in federal spending as a percentage of gross domestic product is a result of increased spending on federal health care entitlements. In the mid-1960s, a group of New York progressives became disillusioned with Johnson’s war on poverty, finding that the real-life consequences of Johnson’s war were to extend and ossify poverty, rather than to relieve it. In 1965, two of them—Daniel Bell and Irving Kristol—founded a journal called The Public Interest. Its first issue published essays not only from Bell and Kristol, but also a future Hall-of-Fame cast including Robert Solow, Jacques Barzun, Robert Nisbet, and Daniel Patrick Moynihan. Kristol et al. did not oppose statism on philosophical grounds—indeed, most of Kristol’s crew had supported Johnson in 1964. But they were liberals who had, in Kristol’s immortal words, been mugged by reality: a reality that Johnson’s “war on poverty” had made worse. When landmark welfare reform legislation was signed into law in 1996, it was because Kristol and his intellectual descendants had succeeded where Goldwater had not: by persuading even moderate Democrats that the old model of welfare dependency was harming the poor. Those moderates were swayed not by philosophical appeals to Jefferson or Locke, but by the overwhelming evidence that they could best help the poor by incentivizing them to gain private employment. The great health reform debate of 2009 and 2010 called attention to the fact that conservatives had not put as much energy into health care reform as they had into welfare reform. Medicare drug benefit aside, Republicans controlled the White House and Congress for most of 2001 to 2006 without being particularly concerned about the fact that health care entitlements were spinning out of control. Members of both parties expanded Medicaid without putting any thought into how the program was deeply harming those it was intended to help. Those days of blissful ignorance must end. It may not yet look this way to the average voter, but our health care system is on the verge of collapse: increasingly inaccessible to individuals and unaffordable to the Treasury. Liberals who claim to represent the interests of the poor need to reflect honestly on how well the poor are served by our present government-run system. Conservatives who speak abstractly of lower spending have a lot of work to do before they can earn the electorate’s trust to enact reforms of their own. This will be a long struggle. The proponents of government-run health care are dug in, and will do anything to stop repeal [of PPACA]. Republicans must bring an equal amount of determination and persistence to the fight—because the stakes could not be higher. In terms of spending, deficits, debt, and size of government, health care is the central battlefield. If Obamacare is allowed to stand, no matter what else happens, the country will move steadily toward ever higher levels of spending and taxation, slower growth and less opportunity, and lower-quality health care. That cannot be allowed to happen. And today’s vote gives us hope that it won’t. I would emphasize that last part: lower-quality health care. Because, at the end of the day, that’s what it’s all about: will Americans gain better health care with a government-run system, or with a free-market one, or some combination thereof? If there is ever to be a bipartisan solution to our health care conundrum, it will be because moderates on both sides come to agreement as to how government policy can best serve the interests of patients and their families. I’ve spent my whole life in the health care world: as the son of a molecular biologist, as a student of science and medicine, and as an analyst of, and investor in, health care institutions. We’re having a critically important debate about the future of our health care system, because the future of our health care system is inextricably tied to the future of our country. I hope I can play a small part in that debate. I hope you will too. Cross-posted from The Corner on National Review Online. The downgrade reflects our appraisal that Japan’s government debt ratios–already among the highest for rated sovereigns–will continue to rise further than we envisaged before the global economic recession hit the country and will peak only in the mid-2020s. Specifically, we expect general government fiscal deficits to fall only modestly from an estimated 9.1% of GDP in fiscal 2010 (ending March 31, 2011) to 8.0% in fiscal 2013. In the medium term, we do not forecast the government achieving a primary balance before 2020 unless a significant fiscal consolidation program is implemented beforehand. Japan’s debt dynamics are further depressed by persistent deflation. Falling prices have matched Japan’s growth in aggregate output since 1992, meaning the size of the economy is unchanged in nominal terms. In addition, Japan’s fast-aging population challenges both its fiscal and economic outlooks. The nation’s total social security related expenses now make up 31% of the government’s fiscal 2011 budget, and this ratio will rise absent reforms beyond those enacted in 2004. An aging and shrinking labor force contributes to our modest medium-term growth estimate of around 1%. In our opinion, the Democratic Party of Japan-led government lacks a coherent strategy to address these negative aspects of the country’s debt dynamics, in part due to the coalition having lost its majority in the upper house of parliament last summer. We think there is a low chance that the government’s announced 2011 reviews of the nation’s social security and consumption tax systems will lead to material improvements to the intertemporal solvency of the state. We even see a risk that the Diet might not approve budget-related bills for fiscal 2011, including government financing authorization. Thus, notwithstanding the still strong domestic demand for government debt and corresponding low real interest rates, we expect Japan’s fiscal flexibility to diminish. One thing that most Americans have yet to consider is what would happen if the bond rating agencies ever downgraded U.S. Treasury debt. Moody’s has indicated that U.S. debt could be downgraded later this decade. If this were to happen, interest rates would rise, further destabilizing our fiscal position and raising borrowing costs for ordinary Americans, and there would be a risk of significant instability in the financial markets. 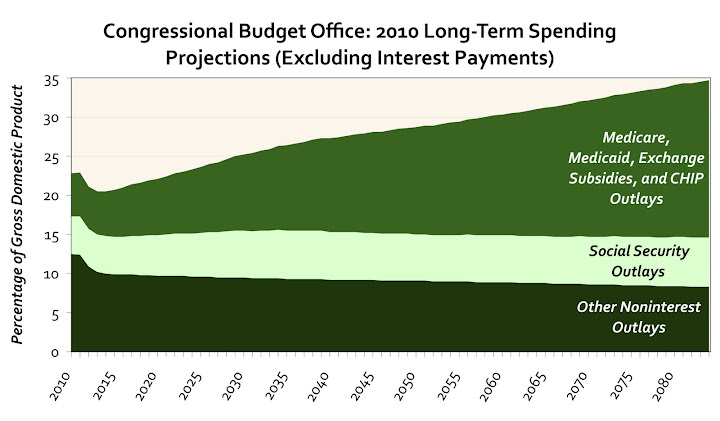 What’s ironic is that last year, the CBO projected a 2011 budget deficit of just $980 billion. What’s a $500 billion, 50 percent error among friends? Indeed, I am the one who committed the error: that’s what I get for blogging immediately upon reading the CBO’s top-line summary, before I was able to read the entire report this afternoon. It turns out that $390 billion of the increase in the 2011 deficit was, according to CBO scoring, a result of the Tax Relief, Unemployment Insurance Reauthorization, and Job Creation Act of 2010 (see page 8 of the full CBO report). So, I owe an apology to the good people of the CBO. However, Kevin Drum and others are also mistaken in arguing that “virtually all of [the $500 billion difference in projections] is due to the extension of the Bush tax cuts.” Page 9 of the full CBO report shows that only $103 billion of the $390 billion is attributable to renewing the Bush tax cuts: $98 billion for “tax rates, credits, and deductions initially enacted in 2001, 2003, and 2009,” and $5 billion for estate and gift taxes. The rest of the provisions were unrelated to the Bush tax cuts: a patch in the Alternative Minimum Tax, a eternal budgeting device similar to the Medicare “doc fix”; a payroll tax holiday; a tax credit for purchases of equipment by businesses; and an extension of “emergency” unemployment benefits. One of the most common complaints that conservatives have with CBO projections is that they do not take into account how changes in tax rates affect behavior and economic growth. Nick Gillespie makes an important point about the Bush tax cuts: the top decile paid more in taxes in 2008, as a share of total revenues, than they did in 2000. Conversely, the share of the bottom half of earners was lower in 2008 than it was in 2000. This, at least, confounds the widely accepted view that “tax cuts for the rich” under Bush worsened the deficit. * Funding for discretionary spending increases with inflation rather than at the considerably faster pace seen over the dozen years leading up to the recent recession. The projected deficits over the latter part of the coming decade are much smaller relative to GDP than is the current deficit, mostly because, under those assumptions and with a continuing economic expansion, revenues as a share of GDP are projected to rise steadily—from about 15 percent of GDP in 2011 to 21 percent by 2021. As a result, the baseline projections understate the budget deficits that would arise if many policies currently in place were extended, rather than allowed to expire as scheduled under current law. So between 2010′s $1.3 trillion, 2011 $1.5 trillion, and 2012′s revised $1.1 trillion, we have $3.9 trillion just in deficit costs to plug. And as Zero Hedge has repeatedly demonstrated the actual debt to be issued is usually about 33% higher than the deficit funding need, meaning that over the next 3 years the US will need to issue about $5 trillion in debt. Which means further debt monetization is guaranteed as foreign investors have now fully withdrawn and the Fed is all alone in gobbling up every dollar in gross issuance. QE3 is guaranteed and we are stunned that the market continues not to realize this. Finally, there is a kind of epistemological divide in thinking about deficits. Those who believe that tax cuts are to blame for our deficit are, by definition, of the view that federal spending at 25 percent of GDP is acceptable, despite its deviation from the historical average of 20 percent. There is at least a plausible argument to be made that 20 percent of GDP should be enough for the federal government to fulfill all functions that are appropriate for it to take on. For those who see the Congressional Budget Office as the most accurate arbiter of future deficit projections, it’s worth noting that its latest projection for the 2011 budget deficit is $1.5 trillion, or 9.8 percent of GDP. 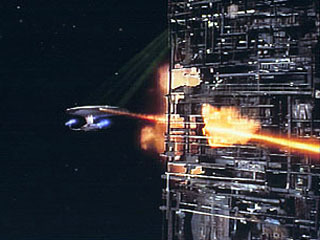 If you don’t find that number astounding on its own merits, note that total projected revenues for 2011 are $2.2 trillion. In other words, taxes would have to go up on every American by 66 percent, at projected levels of economic activity, in order to pay for our 2011 spending commitments, including interest on the debt. UPDATE: Some are pointing out that the extension of the Bush tax cuts is responsible for a portion of the difference between the CBO's 2011 and 2012 estimates, which is a fair point. However: (1) only in part: the rest of the difference comes from spending growing faster than predicted and economic growth growing slower than predicted; (2) the CBO's static scoring system underestimates the impact of tax changes on economic growth, exaggerating the fiscal impact of the tax cut extension. Check out the links above for a detailed discussion. UPDATE 2: See my follow-up post for an important correction. PPACA’s infamous 1099 rule, which requires individuals and businesses to fill out a separate IRS form for any vendor they spend more than $600 on in a given year, was one of the fiscal devices the law’s authors used in order to improve its CBO score. Repealing it appears to have garnered bipartisan support. If Republicans intend to offset this tax increase with spending cuts or other tax increases, it is strategically important that those offsets are unrelated to PPACA, so as to improve the CBO score for repealing the law at a later time under reconciliation rules. As to the President’s policy-via-selective-anecdotes: (1) The incidence of insurers refusing to cover people because they have pre-existing conditions is vanishingly low; (2) Obamacare will drive health costs skyward, placing severe burdens on individuals and small businesses; (3) closing the Medicare prescription drug “donut hole” will increase wasteful Medicare spending, make entitlement reform more difficult, and increase the price of important medicines; (4) forcing all plans to cover “adult children” up to the age of 26 drives the cost of insurance up, making it less affordable for the very people who need it. When it comes to health care, the Fiscal Commission accomplished very little, so the fact that the President finds himself to the left of that body is telling. Furthermore, it’s laughable for him to say that Obamacare will “slow these rising costs,” when the law includes trillions of dollars in new entitlement spending. The one area where Republicans and the President might be able to make progress is malpractice reform, though given his disinterest in the issue during the Obamacare debate, one can’t be too optimistic. I’ll put out a new post with comments on Paul Ryan’s response, either later tonight or tomorrow. What we already know about the President’s health care law is this: Costs are going up, premiums are rising, and millions of people will lose the coverage they currently have. Job creation is being stifled by all of its taxes, penalties, mandates and fees. Businesses and unions from around the country are asking the Obama Administration for waivers from the mandates. Washington should not be in the business of picking winners and losers. The President mentioned the need for regulatory reform to ease the burden on American businesses. We agree – and we think his health care law would be a great place to start. Health care spending is driving the explosive growth of our debt. And the President’s law is accelerating our country toward bankruptcy. Just take a look at what’s happening to Greece, Ireland, the United Kingdom and other nations in Europe. They didn’t act soon enough; and now their governments have been forced to impose painful austerity measures: large benefit cuts to seniors and huge tax increases on everybody. 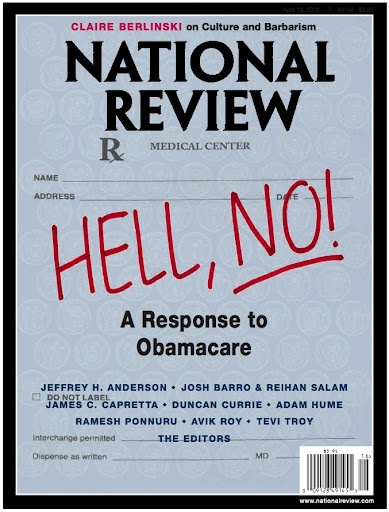 Reprinted from the April 19, 2010 issue of National Review. From the moment Democrats introduced health-care legislation last year, Republicans focused on the adverse impact it would have on the federal debt. But what is remarkable about the Patient Protection and Affordable Care Act is that its effect on the debt is not even its worst feature. That distinction goes to its devastating consequences for the cost of health insurance. Consider the numbers: Based on the gimmick-free assessment of former Congressional Budget Office director Douglas Holtz-Eakin, from 2010 to 2019 the act will increase the debt by $562 billion—almost $5,000 per household. Not great news, to be sure. But a PriceWaterhouseCoopers analysis projected that, over the same ten-year period, Obamacare will increase the cost of health insurance by approximately $20,000 per family. This cost will be borne primarily by the young, who will be forced to subsidize the care of the middle-aged; by freelancers and small-business owners, who will not benefit from the exemptions afforded to large, self-insured employers; and by middle-class families, who will most feel the squeeze of higher insurance costs yet will also be expected to finance the health care of others. The effects of this legislation on the debt are worrisome indeed. But, barring a Weimar-style collapse of the U.S. economy, they will be less visible to the typical family than health-care inflation will be. Rapidly rising insurance premiums will blow a hole directly in the monthly paychecks of tens of millions of middle-class households. 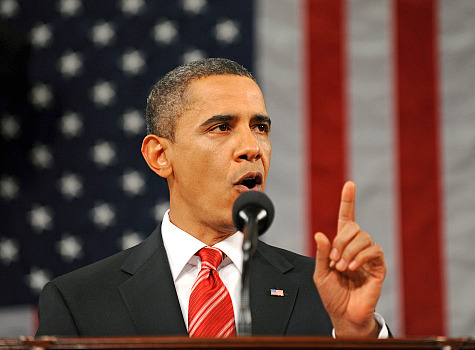 In his stump speech on health-care reform, President Obama liked to say that the Democratic plan incorporated “almost every single serious idea from across the political spectrum about how to contain the rising costs of health care.” The opposite is closer to the truth: The best ideas for lowering health-care costs—unshackling insurance from employment, expanding consumer choice, and enacting malpractice-litigation reform—are either absent or unrecognizably weakened in the law. On the other hand, its blizzard of new insurance mandates, its dramatic expansion of Medicaid, its array of new taxes, and its protection of hospital monopolies will most assuredly accelerate the growth of the cost of health insurance. 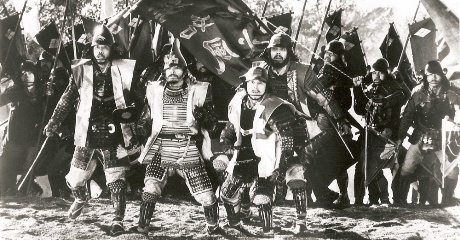 Take the mandates. The law compels insurers to accept all comers, regardless of preexisting conditions, something that prior law had already required for those with preexisting insurance. The new stipulation incentivizes people to wait until they are sick before buying insurance. If insurers receive premiums only when people are sick, they will have to charge more. Indeed, this provision obliterates the whole point of insurance, which is to average the high cost of caring for the ailing few with the low cost of caring for the healthy multitudes. The individual mandate, which requires that healthy people buy insurance or pay a $750 fine, will do little to mitigate the perverse incentives of this provision. The annual cost of insurance is far greater than $750. Many healthy people will prefer the fine; they can always buy insurance later. The law contains other thoughtless but pleasant-sounding regulations, nearly all of which will drive up the cost of insurance. These include: banning preexisting condition exclusions for children; eliminating lifetime and annual limits on insurance payouts; constraining the degree to which insurers can charge less to the young; and stipulating the percentage of premium revenues that must go to patient care. Each of these requirements, by increasing what insurers must spend on health care, increases what they must charge their policyholders. Another reason for the current high cost of private health insurance is the fact that government-sponsored health care, in the form of Medicare for the elderly and Medicaid for the poor, underpays hospitals and doctors for their services. Health-care providers are thereby forced to charge more to those with private insurance, to the tune of $90 billion a year. Obamacare will make the problem worse by adding as many as 20 million more Americans to the rolls of Medicaid. Democrats claim that by reducing the degree to which the uninsured use the system for free, expanding Medicaid will reduce overall costs. But it turns out that cost-shifting from the uninsured to the insured amounts to only a fraction of the cost-shifting caused by Medicaid and Medicare underpayment. The more these new Medicaid enrollees take advantage of their benefits, the more private health-care costs will rise. Unsurprisingly, taxes will play a role in the impact of Obamacare on health-care costs. The law imposes annual excise taxes of $2.3 billion on pharmaceutical products, $2 billion on medical devices, and $6.7 billion on health insurance. Companies will be forced to pass these taxes on to consumers. The logic of taxing the sale of health-care products in order to subsidize their purchase is sublimely Washingtonian. One of the biggest causes of health-care inflation is hospital monopolies. Many American communities are served by only a single hospital or hospital chain. These hospitals are free to jack up prices at will, knowing that insurers have no choice but to pay them. Across the country, small groups of physicians have banded together to found specialty hospitals focused on one area of medicine, such as heart surgery or injury rehabilitation. These smaller outfits draw patients away from the larger hospitals by offering lower prices, higher quality, and better service. But the big incumbent hospitals usually are among the largest employers in their communities and thereby hold considerable sway with politicians of both parties. Inevitably, hospital lobbyists had their say on the health-care bill: They inserted provisions banning the construction of new physician-owned hospitals, and restraining the growth of those already in operation. In all of these ways, Obamacare will drive up health-care costs. These concerns are not theoretical: They are borne out by an examination of insurance prices in the 50 states. Those states that impose onerous mandates, subsidize health-care spending, raise taxes, limit hospital competition, and ignore malpractice litigation are those in which costs have risen the fastest. Over the next several years, as the new law accelerates health-care inflation, don’t expect Democrats to take responsibility for the problems they will have caused. Instead, they will blame them on the demonic greed of insurance companies. But insurers are caught between two rocks and a hard place: They can raise premiums to reflect rising costs, deny care to policyholders, or go broke. That’s a lose-lose-lose proposition for consumers—but, for the Left, it’s win-win-win. Any of these outcomes will be exploited to argue that the free market can’t work in health care, and that the only solution is a European-style single-payer system. Replacing the new law with a more sensible set of reforms is imperative. It is true that Obamacare will expand the size of our debt and the reach of our government. But it will also leave Americans with unaffordable health care—the very opposite of what they were promised, and the harbinger of a far graver crisis.